When does life really start? asks W M Nixon. Maybe it’s when the kids have grown up and left home, and you’ve the resources to buy the dream second home for the perfect holidays of your retirement. Of course, 95% of people in this situation would be thinking in terms of that dream second home as a cottage or ultra-modern house somewhere on a magic coastline, or in a very special bit of countryside. But when George and Mary Coombes of Castleknock in Dublin found that everything in the jigsaw would be coming together for a very special way of life to begin as his 60th birthday approached in May of this year, their choice for the essential second home was rather different. They sought a boat which would be capable of crossing oceans, at least in the more meteorologically gentle parts of the world. But this dreamship would then have to provide all the amenities of a comfortable house once they’d reached one of their desired cruising areas. In the end, all roads led to a roomy multi-hull, and in their choice they were guided by Ross O’Leary of MGM Boats in Dun Laoghaire. They’d ample time to make their final selection, as George took retirement from a full career – initially serving with the Army, then 30 years in An Garda Siochana - at the age of 50, leaving the two of them with a decade to elapse before all aspects, including expected resources and their four children’s maturity, were properly in place to enable them to get up and go. George had taken to sailing with enthusiasm once he’d discovered it through the Army’s link-up with the Glenans base which used to be on Bere Island in West Cork, continuing with the Gardai Sailing Club’s First 27.7 in Dublin Bay and the Army’s group-owned Amel 48 in Croatia, where he acquired a passion for cruising in attractive locations. Mary – originally from Sligo, but long since thinking of herself as a true Dub – began to be interested as well, and with his retirement approaching they started to think seriously about how to go about it. 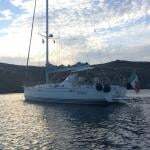 By 2014, they’d taken their Yachtmaster Coastal Certificates with Ronan O Soichru of Irish Offshore Sailing in Dun Laoghaire, and were researching their many options as avid followers of the best cruising forums. 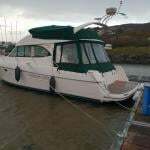 Although they’d had mainly mono-hull experience in their cruising, by 2015 the clearly-defined nature of their future requirements pointed increasingly to a multi-hull, and they were in regular exchanges with Ross O’Leary of MGM Boats. O’Leary for his part was intrigued by the story of how this engaging couple had come through their unusual routes to the heart of the sailing dream. Thus something which initially had been a business enquiry fielded by someone at the core of the sailing establishment (in addition to selling boats, Ross somehow finds the time to be the Captain of the Dublin Bay Laser fleet) quickly became a professional connection blossoming into friendship, and for more than two years they shared the quest of finding the ideal boat for a complex set of requirements. The multi-hull solution provided the answer in terms of space and a stable platform which would feel user-friendly for the many friends and relations whom they expected to join them at various stages of their planned odyssey. But it had to be a special multi-hull which puts at least as much emphasis on comfort when the boat is at rest as it does on performance. No-one would claim that the distinctive Lagoon range are the fastest catamarans on the ocean. But they can slip along at a brisk pace with sheets freed, and they do so in a remarkably smooth style. With their small keels, they can make to windward under sail if required, yet with a powerful engine in each hull, there’s a very viable alternative means of getting there. But once in port, whether in harbour or in a secluded paradise anchorage, the Lagoons are in a class of their own. The sense of space skillfully and very attractively utilised is all-pervading. This really is a floating holiday home which can be easily moved to the next location by whatever method of propulsion suits the mood of the day. Ross O’Leary was working at the Show, but also keeping his eye on the Lagoon 450 S on display, as it matched the Coombes’ requirements through being the three-cabin owners’ layout, while the interior joinerywork was in the darker finish which Mary had said she would prefer. Although the type was selling well, other potential owners and charter operators wanted different options. So as the show progressed, Ross called George and Mary and told them to get themselves down to Cannes pronto, as he felt an attractive bargain could be struck there and then on what seemed to be a boat very close indeed to their dreamship. Thus it was that we found ourselves in the MGM Boat Show at Howth YC Marina in May 2018, shooting the breeze about those who dare to realize the dream aboard the new Lagoon 450 S Realta Bheag, that same boat from Cannes, but now with many factory-added extras to enable George and Mary to sail the seas as self-reliantly as possible, yet provide a proper and comfortable welcome for family and friends when they came as guests. That the boat was ideal for this became evident in Howth as visitors came and went with ease of movement – boat buffs were there, and friends and family, with the latter category ensuring that Ross O’Leary was at one stage left literally holding the baby, which he did with style as befits a man who has seen it all. As for the boat herself, people accustomed to mono-hulls have to adjust their mind-set completely in order to assess the merits of a spacious accommodation which essentially stays virtually level, thereby allowing a freedom of movement through extensive spaces both below and in the several multi-purpose areas on deck. It takes a while to grasp that this luxurious layout, which speaks eloquently of choices – particularly in sunshine situations – is combined in a workmanlike seagoing vessel with twin 57hp Yanmar diesels, virtual self-sufficiency with generators, solar panels and other sources of power creation, an easily-handled yet effective rig, and comfortable accommodation for six with the starboard hull entirely given over to the owner’s master-cabin with all amenities, while the port hull has two en suite doubles. Self-reliance and the potential for ease of independence in anchoring were among George and Mary’s primary requirements, and it was typified by the setup for handling the ground tackle – anchors, chains and so forth – with a high-powered windlass neatly available to cope with laying and retrieving the 40kg Rocna anchor. Most part-time cruisers think in terms of pontoon berths or using visitors moorings for overnight or prolonged stops, but the serious cruising community - which George and Mary have now joined – thinks primarily in terms of being able to anchor independently. When I contacted George on Monday evening of this week to find out how things were going now that everything was finally under way with Realta Bheag having made her departure from Dun Laoghaire last week, it was to find that they were heading into the south side of Dungarvan Bay and the handy passage anchorage close west of Helvick Harbour, confident in the knowledge that they’d find a secure independent overnight berth, and a restful night - which they duly enjoyed. They’re headed initially in gentle stages towards West Cork before taking their departure for Portugal and eventually the Atlantic Rally For Cruisers from the Canaries in November, heading towards the Caribbean and taking in the Cape Verde islands option on the way. But since our first meeting in May, they’ve been busy with ensuring that their affairs at home will be in order while they have a prolonged absence, and there have been family events to cope with. As well, there has been a steady list of continuing mods to be made to the boat, for at all times possible since May, they’ve been putting in sea trials. They were already familiar with Realta Bheag’s sea-going performance by the time she arrived in Ireland in late April, as they’d brought her up themselves from the builder’s commissioning port of Les Sables-d’Olonne. As part of the take-over package, a professional skipper set out with the new owners, but by Falmouth he said that George and his brother and Mary were clearly competent to complete the voyage to Ireland on their own, and thanks to successfully dealing with headwinds on the open Atlantic part of the passage, they arrived in Dun Laoghaire with added confidence in their new boat and their ability to handle her, and even more confident that they had made the right choice for their complex set of requirements. So now, the voyage is under way. West Cork and its cruising associations means a lot to them, so before leaving Ireland, George and Mary and their crews – they’re currently crewed by his brother Declan and family friend Frances Doyle – hope to visit that Irish cruising paradise. But as they settle into the shipboard life, they’re doing it in easy stages down the Irish coast, and keeping a promise to call with Ross O’Leary who’s currently with MGM in Crosshaven for Volvo Cork Week, where the company is sponsoring the results system. Quite where and when Realta Bheag’s final departure southward from Ireland takes place will depend on how the winds develop in the next week or three. But since early July, George and Mary Coombes have essentially been living on board Realta Bheag. She is now the centre of their life. The dream is on.